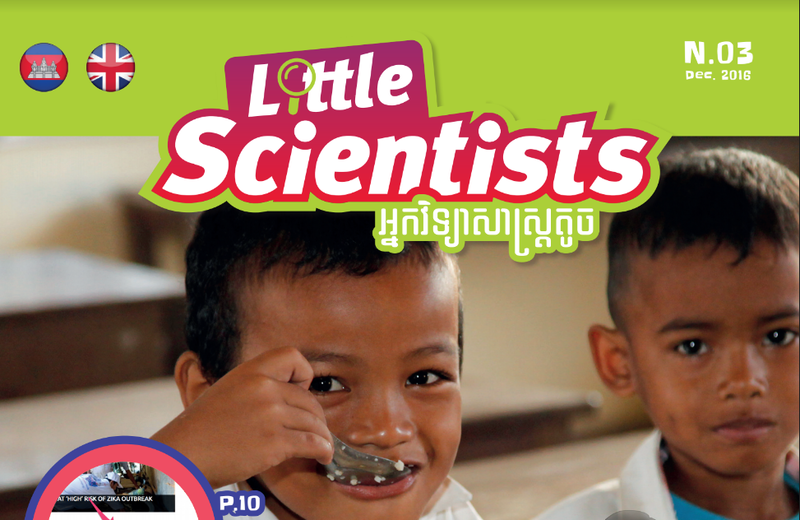 Little Scientists is a monthly-bilingual magazine, in Khmer and English, geared towards primary aged children to help promote STEM education across Cambodia. This magazine contains diverse sections such as features, news, interviews, games, quizzes, hands-on experiments and other educational resources. The aim is to expand children’s understanding of the STEM fields while having fun, gaining exposure to real world application and increasing knowledge, information and awareness about careers in STEM fields. Rich and colourful illustrations and infographics, appealing photographs and amusing cartoons draw readers to the text and engage them in learning. Little Scientists uses current, local and highly engaging topics to show readers the practical value and exciting potential of each STEM discipline and introduce readers to important jobs that they may never have heard of.